Red 2018 Mitsubishi Eclipse Cross SE 4WD CVT 1.5L I4 Turbocharged DOHC 16V LEV3-ULEV70 152hp Accessory Carpeted Floor Mats & Portfolio, All Weather Floormats (4), Automatic temperature control, Black Lug Nut & Wheel Locks, Cargo Mat, Cargo Net, Front dual zone A/C, Quick Value Package 1, Radio: AM/FM 7.0`` Smartphone Link Display Audio, Rear Bumper Step Protector. 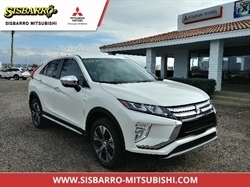 Hello, I would like more information about the 2018 Mitsubishi Eclipse Cross, stock# MI8253. Hello, I would like to see more pictures of the 2018 Mitsubishi Eclipse Cross, stock# MI8253.